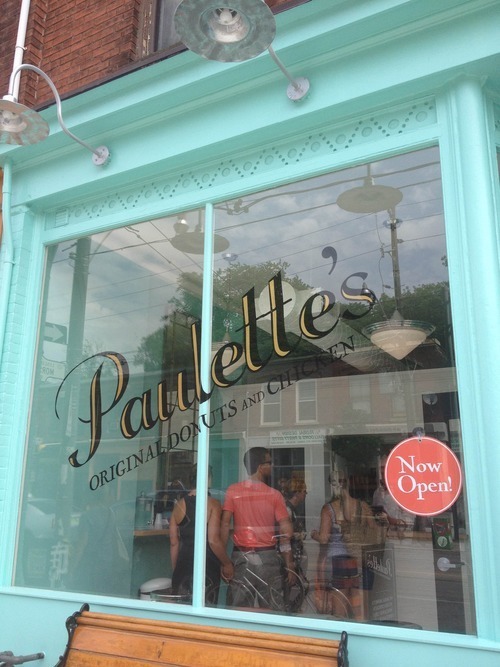 The newest food pairing comes to you from Leslieville at Paulette’s Original Donuts and Chicken. This tiny Tiffany-blue, vintage style restaurant serves up double-fried naturally raised, free-run birds, and delicious, unique cake donuts. Open for about 3 weeks now, this place is booming with line-ups, and sells out on most days before their 7:00 PM closing time. 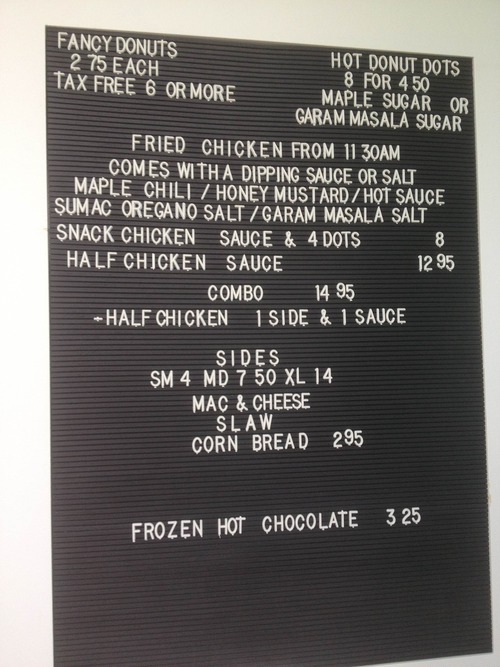 The menu ranges from snack size (2 pieces of chicken) with choice of dipping sauce or salt, and 4 dots (mini Timbit-like donuts rolled in Garam Masala sugar). You can also order a half chicken (4 pieces) with choice of dipping sauce or salt. The choice of sauces are Graham’s Burnin’ Hot Sauce, Maple Chili Dip, and Honey Mustard and Herb dip. As for the salts, there are Garam Masala Salt, and Sumac Oregano Salt. On the side you can choose from Mac and cheese, corn bread, or coleslaw. Now I will get to the goods and share what Jonty and I indulged in, as we were super excited to give this place a try! 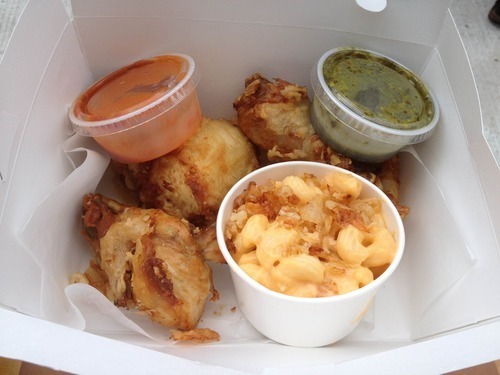 We went for the half chicken combo, with a side of mac and cheese. The chicken was lightly fried, which I was pleasantly surprised about. 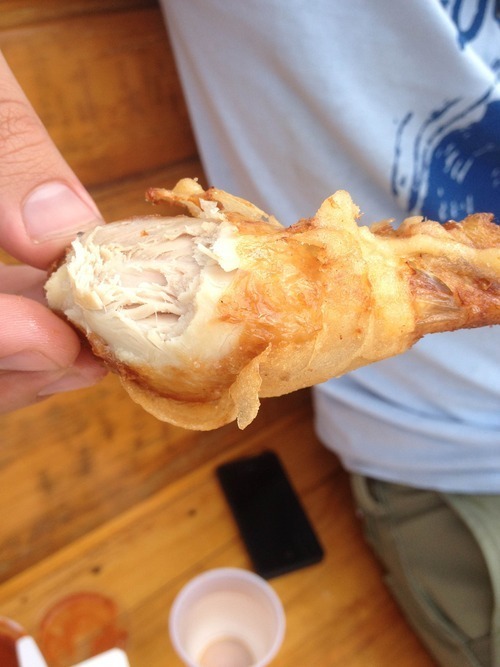 Although a good, thick coating is always delicious, it was refreshing to bite into the juicy, tender chicken without having to tear through inches of batter. It was crispy and not overly greasy which makes it feel just a little healthier; FEEL being the key word! Regardless, it was delicious. The side of mac and cheese was incredibly creamy but had a slight tang to it which was not my favourite. The topping of crispy chicken skin however was a nice touch. None of the sauce choices excited me, but it comes with two so we chose the hot sauce, and honey mustard and herb dip. They both were quite tasty, but the chicken was yummy enough on it’s own that we barely touched the sauces. All I could think about while chowing down on my chicken (besides how “mmmm” it was) was tasting the donuts! 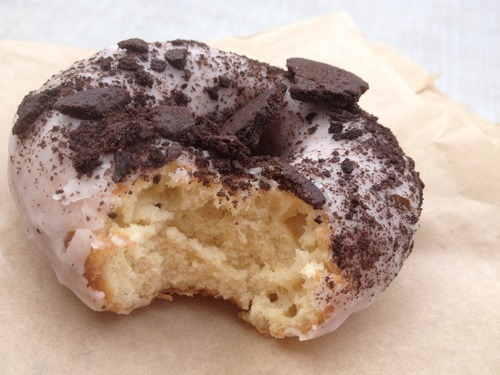 After taking my last bite of fried goodness I immediately pulled out my D’oreo donut. 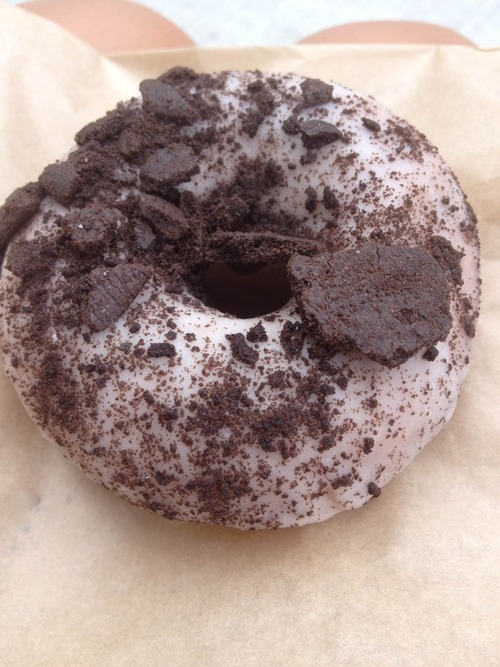 It was a moist, cake donut dipped in white icing which tasted exactly like the middle of an Oreo! It was also sprinkled with of course, Oreo cookies. I loved every second of it. Jonty’s choice was the Root Beer Float. I am not a fan of root beer but it was still quite delicious. The flavour of root beer was not too over-powering and the donut itself was very tasty. 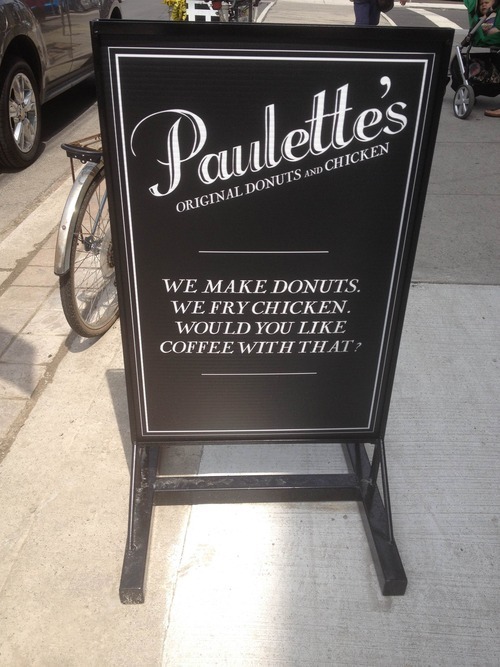 Just when I thought I loved fried chicken and waffles, Paulette’s entered and stole the show. To say that Playa Cabana has been highly recommended would be an understatement. I have heard from numerous friends and family that this tiny Mexican joint is a must-try. You would never guess that among a residential area on Dupont just East of Davenport sits this hidden gem. On any given night, this place is packed from open until close. Somehow, Jonty and I called around 6:00 PM on a Saturday night and got a reservation inside for 9:00 PM. We did want to sit outside however, but figured we would take what we could get. We have tried multiple times to get a reservation but have never been lucky, so I’m sure you could guess how excited we were. When we arrived at the booming restaurant, we asked if there was any way we could sit on the back patio. The hostess said she would see what she could do, and before you knew it, we were seated outside. I absolutely loved the ambiance back there. I felt like I was in someone’s backyard. Although it was pretty cramped, the warm summer night and candlelit table made for the perfect backdrop to this highly anticipated dinner. The staff were incredibly friendly and accommodating, regardless of their busyness. All of the food is fresh, local and made from scratch, which truly allows for the full flavour to shine through. 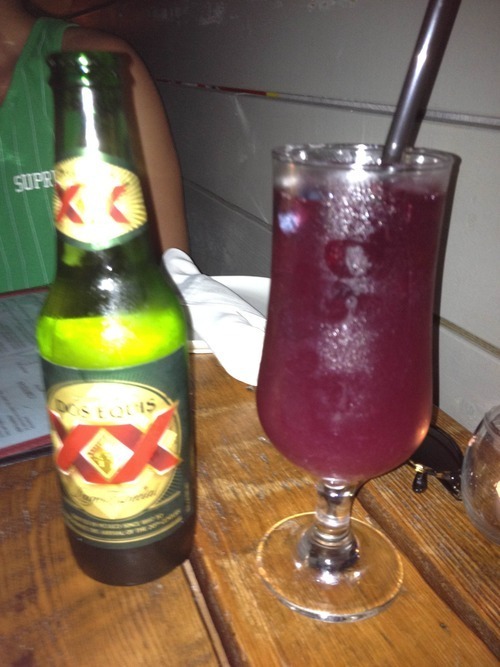 We started with drinks, and I ordered red wine sangria, and Jonty chose a Mexican beer, Dos Equis. As for the food, we were so overwhelmed by the menu. 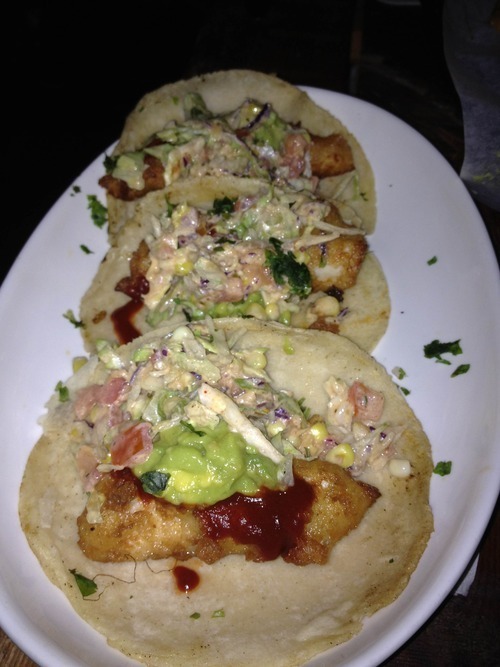 The fish tacos, as well as chips and guacamole have been recommended to us, which are right up our alley. 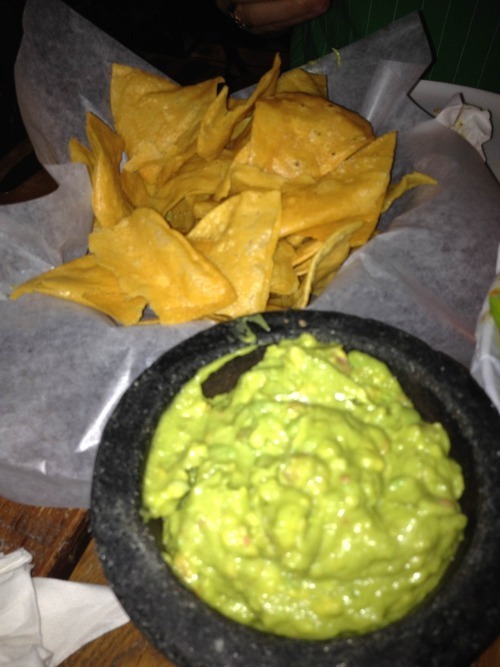 For appetizers, we ordered the homemade guacamole and tortilla chips made from simply corn and water. The guacamole was incredible smooth and creamy, and I think it is the best I have ever had. The chips also had a wonderful crunch to them and weren’t too oily. The “Cubeta de camaron” also caught our eye. 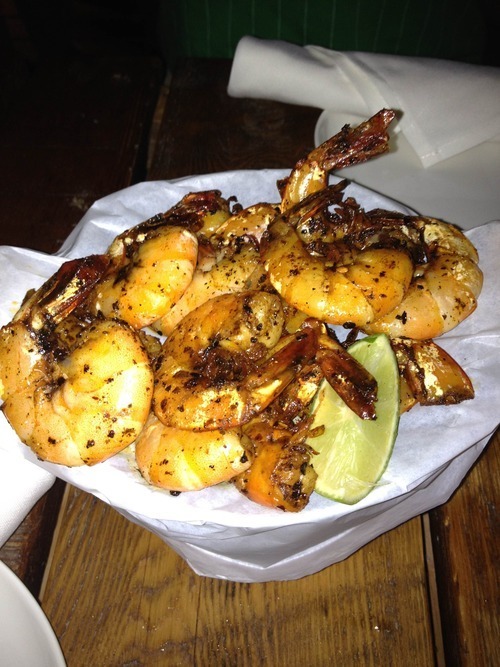 It was a bucket of shrimp tossed in an arbol-garlic butter. Arbol is a type of chili pepper, which added a tiny bit of heat to the buttery shrimp. These shrimp come with the shell and legs on in order to preserve the flavour. We couldn’t take our hands off of these and can’t wait to go back for more. As for the main course, we shared the fish tacos. The fish of the day was Atlantic cod, and we chose them battered instead of grilled. It was pretty dark outside so I could barely see what I was eating, but all I know is that it tasted pretty darn good! We are already planning on making another reservation at this goldmine in the very near future! Nestled on Yonge St. just south of Eglinton lies Coquine. You can usually find this adorable French Bistro pretty packed with patrons lingering by the bar, lounging on the patio, or simply dining inside. I have eaten here before so I was eager to return for some memorable dishes, this time for my father’s birthday. The heat wave we are currently experiencing in Toronto led us to a quiet table in the back room where it was a little bit cooler. Unfortunately they are lacking in air conditioning, so the back is where you could feel the least heat. Nonetheless, it was still a gorgeous experience. 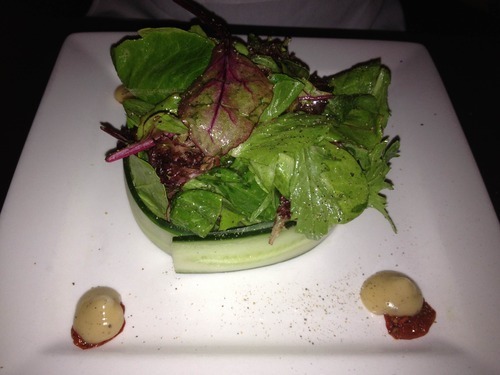 We started off with a simple green salad, presented ever so nicely, wrapped in thin cucumber slices. 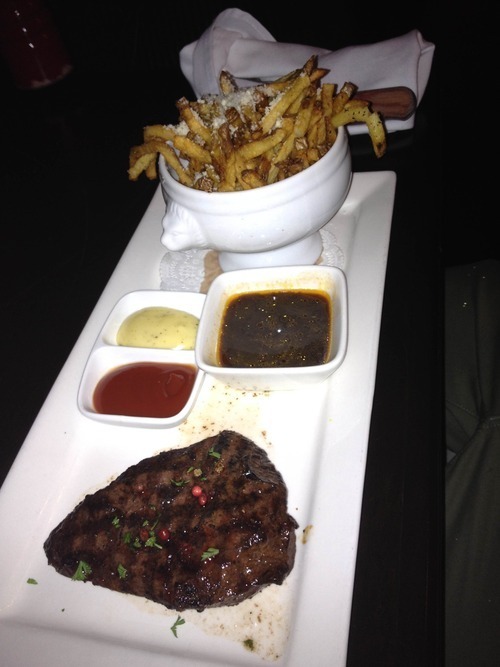 Being a French Bistro, it is a no brainer that we ordered the Steak Frites. This medium flat iron steak was served alongside truffle oil and parmesean frites, which were to die for. They were thin, crispy and absolutely delicious. 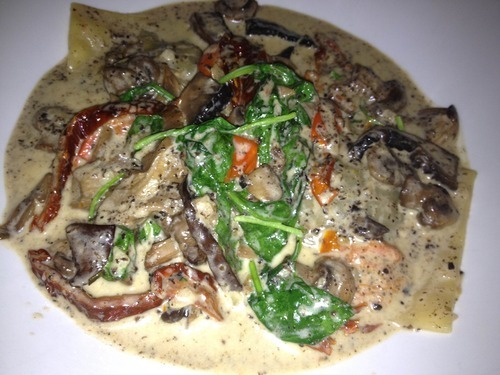 Since Jonty and I love sharing a couple dishes, we also ordered the Wild Mushroom Ravioli. Now I know this doesn’t sound like anything special, but I can guarantee it is like nothing you could ever imagine. These mushroom stuffed pasta are served surrounded by sundried tomatoes and spinach in a white wine truffle cream sauce. I remember ordering this dish last time and recall it being amazing, but wow, I was literally shocked at the flavour. It was so tasty that it is almost indescribable. The truffle really shines through the creaminess, as well as the pasta and mushrooms being perfectly cooked. This dish is a must-try!